As you can see, the blog has a new look. It was time for a change, especially since there are big plans for improving it this year! I’ve been inspired by some other blogs I read and am working on a schedule for when I will be posting this year. I want to be sure to deliver on my promises for new patterns, book reviews, and everything else! In addition, the sewing room is getting completely reorganized. As you can imagine things are kind of wreck after all the holiday crafting! I am in the process of getting rid of a bunch of yarn that I bought years ago when I thought I would become a knitter. It’s great yarn, but knitting is not for me. Luckily, I have a few friends who are knitters and we are organizing a craft supply sale so I should be able to find a nice home for it (and maybe pick up some new supplies myself). I also have a stash of fabric that I plan to sell on Etsy. I’ll let you know when it is available :). One of the big things I am doing is reorganzing my wool. 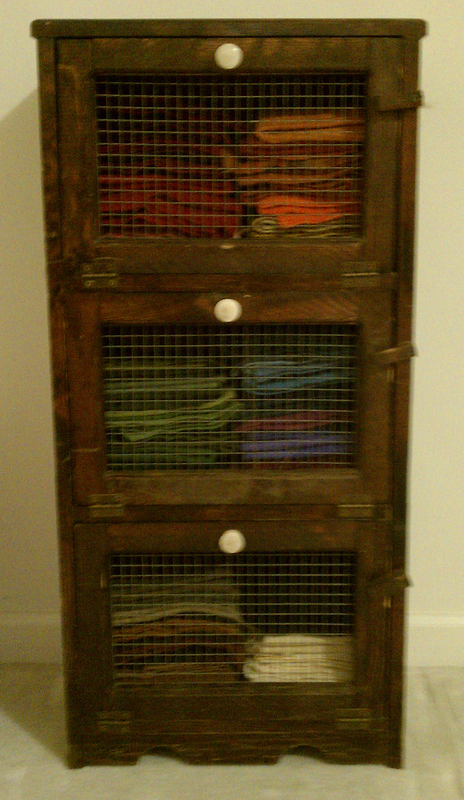 I find this great little cabinet at the thrift store a few months ago and finally got around to cleaning it up and putting my wool into it. Since I am getting ready to embark on a wool dying adventure, I need to have things handy and place to put all the new wool I’ll be making. 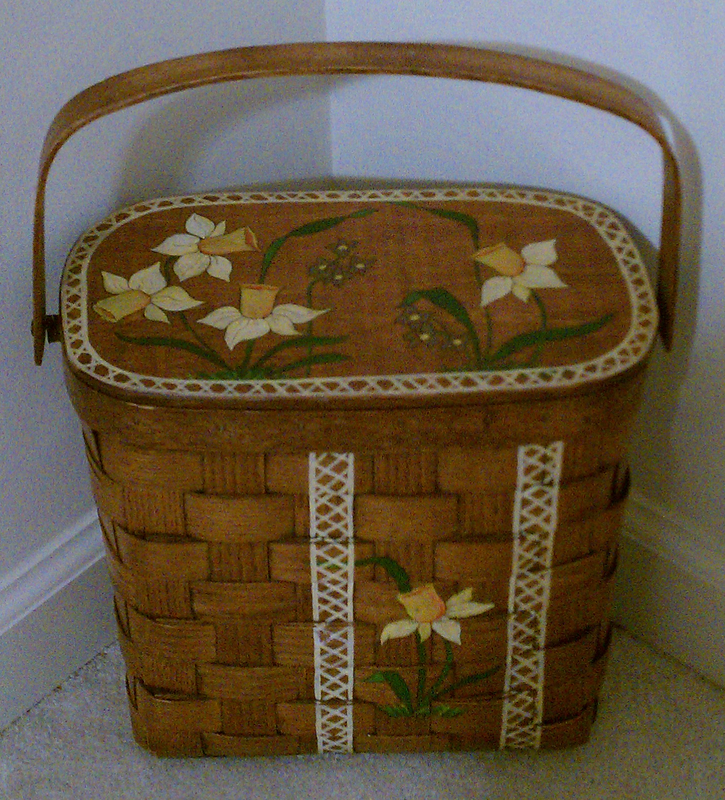 I also found a few cute sewing baskets at the flea market. 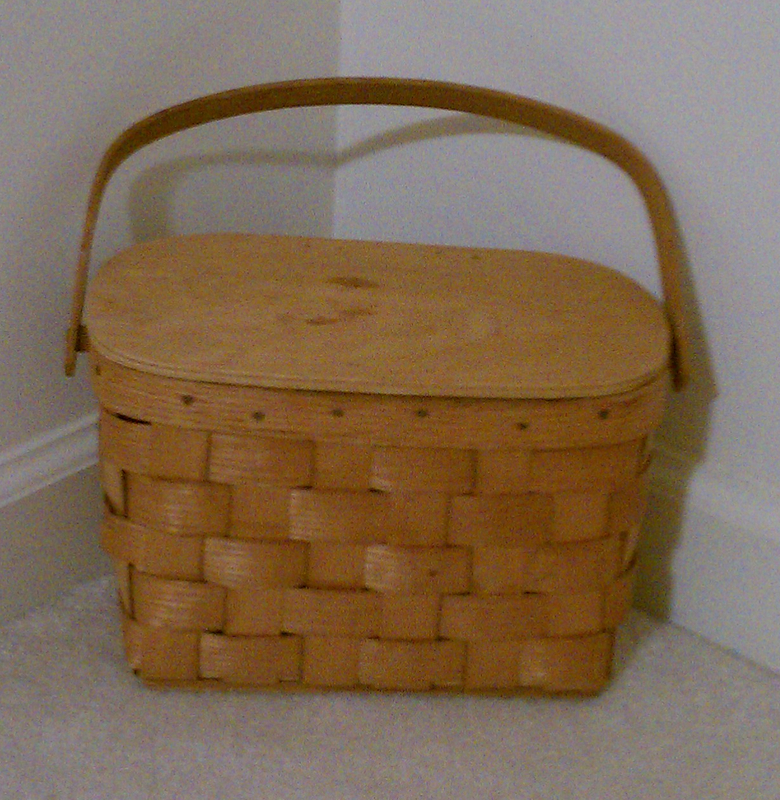 They are both nice handmade baskets out of oak and only cost about $2 each (which I couldn’t believe). The one with Daffodils painted on it is also fully lined with this funky quilted fabric from the 70’s. It’s the perfect size for carrying supplies for a wool project. In other news, a new quilt store has opened in town – Whistle Stop Quilt Shop – and I will be teaching some classes there in a month or two. I’m really excited and will be posting class information when I have all the details worked out. This entry was posted in Flea Market Finds, Household. Bookmark the permalink.